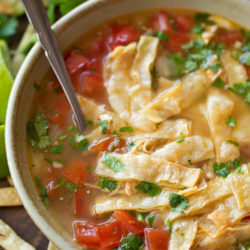 This Instant Pot tortilla soup is light yet so incredibly flavorful! It’s so easy to make, just prep the veggies and let the Instant Pot do the rest! I grew up in a really small town in northern California. We didn’t really have any fancy restaurants, just a few chains and LOTS of mom & pop places. What we did have was good Chinese food, good burgers and good Mexican food. 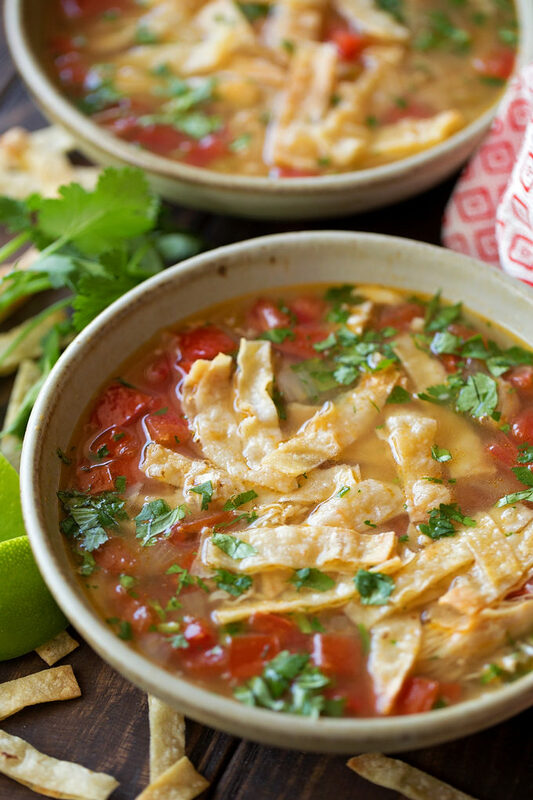 I can remember going to one particular place and falling in love with their tortilla soup. I can’t even recall how many times I’ve had it. It is simple and so delicious! 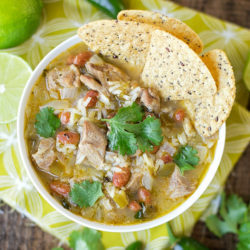 This is my Instant Pot version (and a slight variation) of that beloved recipe. Now onto the meat. You can use chicken breasts or boneless skinless chicken thighs or a combination of both. Just remember you’ll need to pull it out and shred it before you finish the soup. This only takes a matter of minutes but it’s definitely necessary. This recipe is rather mild in terms of heat. In the recipe below I give a range of how much jalapeño to add. If you don’t like spicy (or you have an unusually hot pepper), only add 1 teaspoon (you won’t even realize it’s there). If you love spicy, go ahead and add 2 teaspoons and some cayenne pepper! I’m leaving it in your hands! 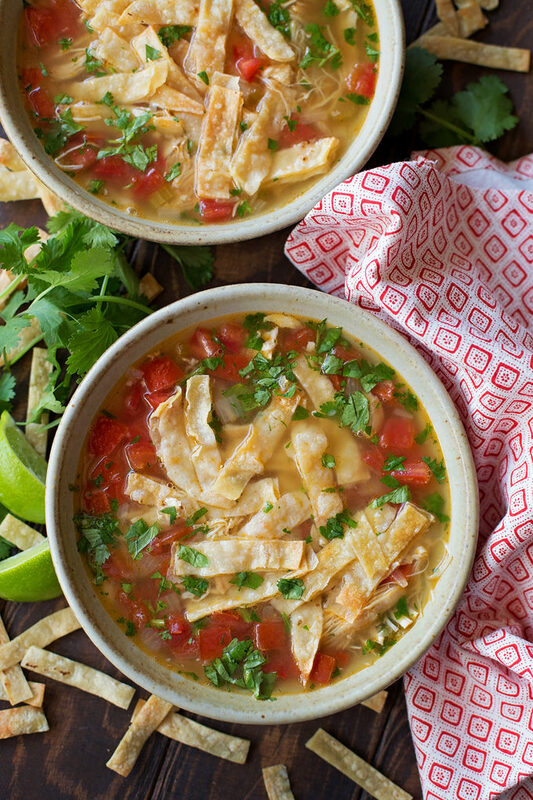 Lastly, do NOT add the tortilla strips until you are ready to serve this soup. They should be the VERY LAST THING you do before you eat. Mine got a little bloated and soggy as I photographed everything. And well, they look a bit unappetizing- sorry 😕. That didn’t stop me from downing two big bowls of it… and it probably won’t stop you either! 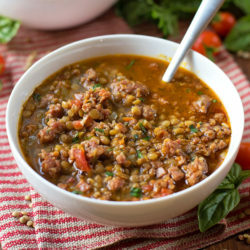 Turn Instant Pot on SAUTE mode. When hot, add the oil. Add the onion, celery, jalapeño, and garlic. Saute for 5 minutes, then add the chicken, chicken broth, chili powder, salt, paprika, coriander, cumin, pepper, tomatoes, 2 tablespoons cilantro, and lime juice. Place lid on and lock. Turn on MANUAL mode with high pressure selected for 20 minutes. Turn switch to VENTING and allow for the pressure to release manually, this usually takes 7-10 minutes or so. Remove the lid and stir in remaining cilantro. 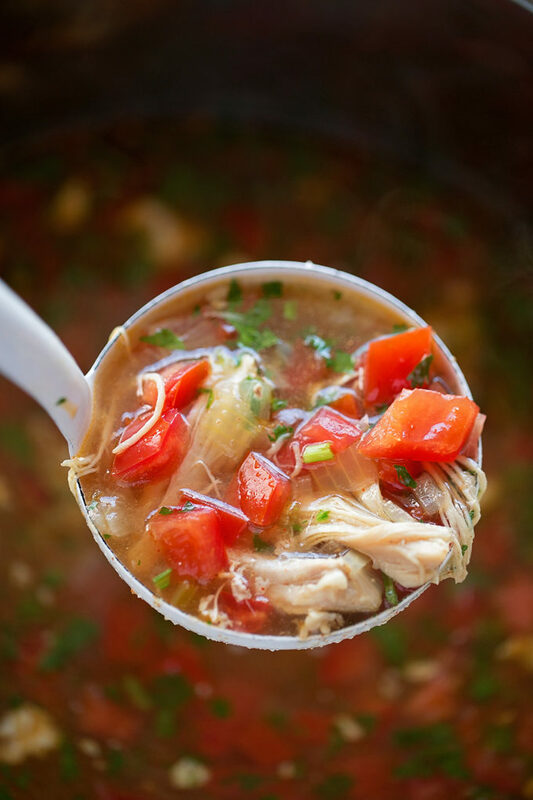 Remove chicken and pull into chunks, return to the broth. 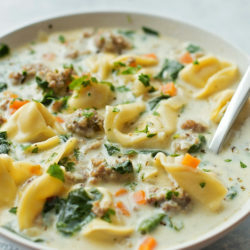 Place a generous amount of cheese in the bottom of each bowl. 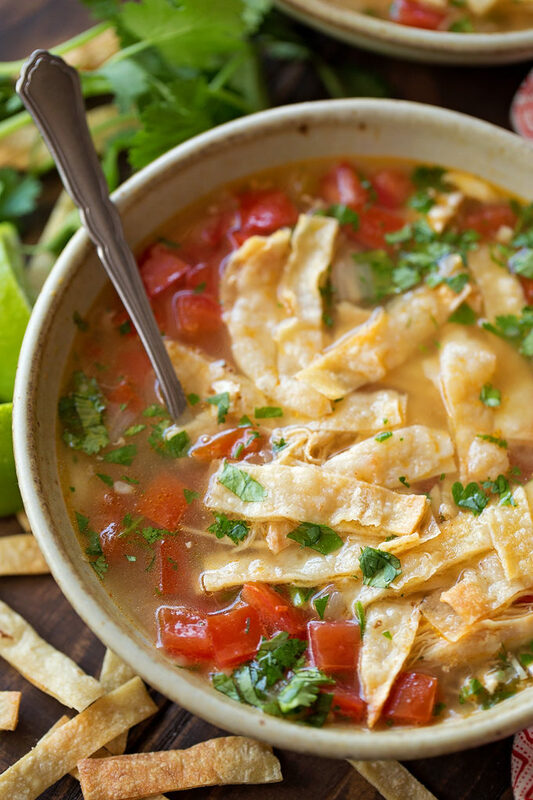 Ladle soup over top, then add tortilla strips. – For even more heat try adding 1/4 teaspoon of cayenne pepper. – You can bulk up this recipe by adding rinsed pinto or black beans. Natalie – you ABSOLUTELY captured this hometown recipe – I love it (and it brings back a lot of fond memories)! 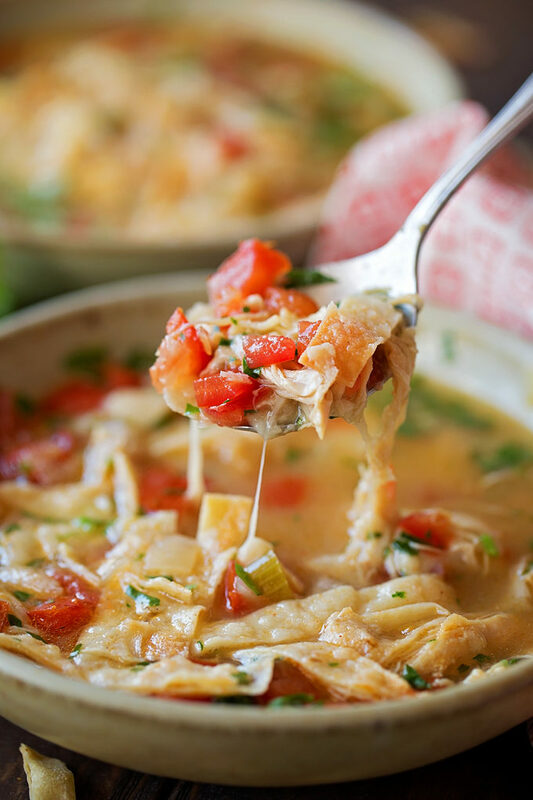 Natalie – you ABSOLUTELY captured the flavor of this hometown soup – I loved it (and it brought back so many fond memories)!